Girls' magazines had existed since before the war. They were, however, intended only to teach girls learn how to become good mothers and wives, and in terms of content, they were just girls' novels with illustrations added for the sake of decoration. In addition, cartoons included in girls' magazines consisted mainly of representations of the comical daily lives of people using simple lines, and not much emphasis was placed on the stories. In 1953, Tezuka Osamu published "Princess Knight" in the "Shojo Club" magazine. 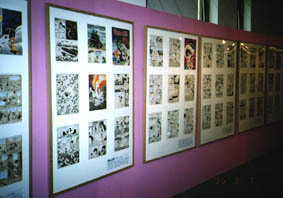 With the publication of this cartoon, Tezuka Osamu, who had already gained an indisputable reputation with "Jungle Emperor Leo" and "Astro Boy," introduced "story Manga" into girls' magazines. 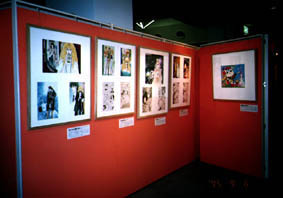 The distinctive feature of story Manga is that a high level of literally supported storytelling techniques and cinematographic methods are used to produce boldly composed and fast-moving pictures. 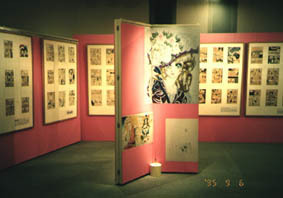 He also added the elements of traditional decorative painting to this technique, giving rise to a new category of girls' Manga, which was different from Manga offered by boys' magazines. 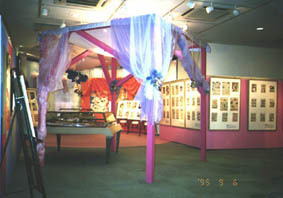 Girls' Manga, however, did not develop because of Tezuka Osamu's talent alone. In this period, ambitious male cartoonists published a series of Manga for girls. 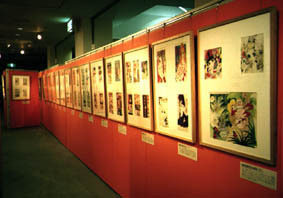 Female cartoonists, meanwhile, also published attractive cartoons using story Manga and other techniques while taking over the tradition of decorative painting. 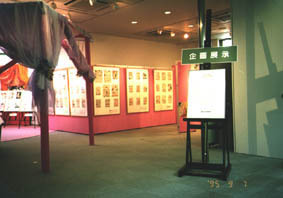 The works they created, reflecting their female sensibilities, were widely accepted among girls, influencing many girls' Manga writers in subsequent years. 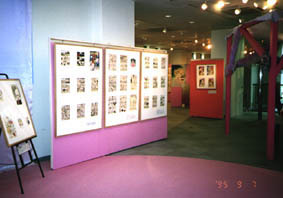 In the decade from 1975 to 1984, a group of female cartoonists called "1949ers" initiated change into the world of girls' Manga. Their eyes were directed to the life and death of individuals as well as their solitude and destiny, rather than to a longing for the unusual. 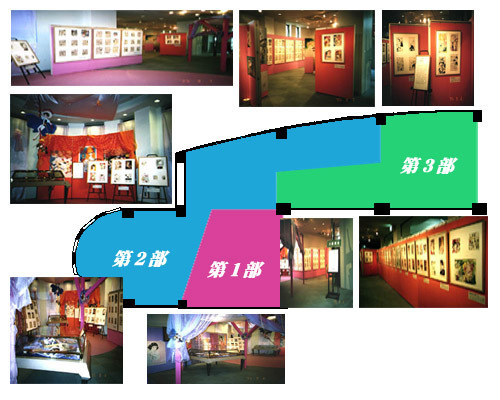 They considered the story elements of Manga essential and pursued their own style and method of expression, developing girls' Manga into an art form of a highly literary nature. This exhibition looks back upon the history of girls' Manga and the process of its development, thus clarifying the meaning that the genre of girls' Manga has today, when Manga has been recognized in itself as a form of culture. Prewar girls' magazines consisted mainly of illustrations-interspersed with some text-by cartoonists who were influenced by the Art Deco movement that flourished in France during the period after around 1910. The distinctive feature of these illustrations is that exotic, sophisticated, clean, and beautiful girls somewhat reminiscent of Western style art were drawn with stylized geometric designs and exaggerated flower patterns in the background. These illustrations were based in themes that every girl in those days would dream of. 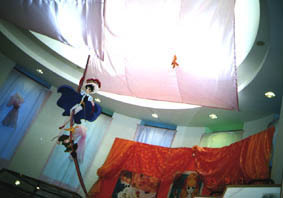 They did not, however, have elements typical of Manga, such as the unfolding of stories and the flow of pictures that accompanied the advancement of scenes. Of course, it was not that there were no conventional Manga for girls. These Manga, however, did not have sophisticated story elements or satirical elements; rather, more emphasis was placed on expression of the humorous, easy, and comical aspects of life based on daily experiences common to everybody. In 1953, Tezuka Osamu published "Princess Knight" in the "Shojo Club" magazine. 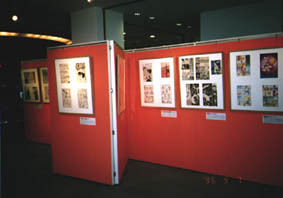 He had already become a popular cartoonist through "Akahon" (red book) Manga published immediately after the war. He had published "Jungle Emperor Leo" in the "Manga Shonen" magazine in 1950 and "Astro Boy" in the "Shonen" magazine in 1952, and these two had won him a nationwide reputation as a cartoonist. 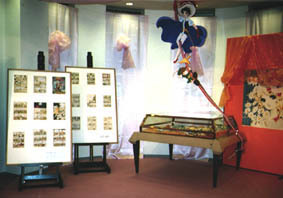 With "Princess Knight," he introduced story Manga into the world of girls' Manga as well. 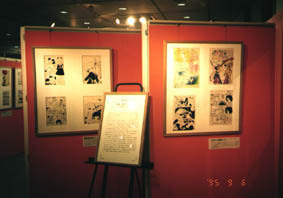 Story Manga featured the development of stories backed by high literary techniques. They also featured arrangement of scenes based on cinematographic methods, including close-ups, varying viewpoints, and sound and shading effects, as well as the introduction of bold compositions and pictures that remind the readers of quick movement. Considering these features alone makes one think that story Manga for girls are the same as those for boys, but Tezuka Osamu incorporated also elements of decorative painting, taken over by girls' Manga writers through the Art Deco movement, into his works, thereby adding a slightly different flavor to girls' Manga. 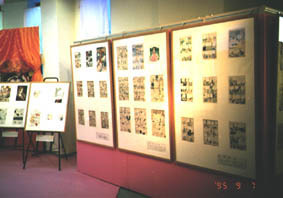 The introduction by Tezuka Osamu of story Manga into girls' magazines influenced the cartoonists of that time. In 1957, Watanabe Masako began publication of the long cartoon "Yamabiko Shojo" in serial form, and in 1960, with the publication of "Maki no Kuchibue," Maki Miyako ushered in a new phase in the decorative painting style of girls' Manga. In "Gin no Hanabira," published in serial form from 1956 to 1959, Mizuno Eiko broke new ground with the introduction of bold compositions and scene arrangements as well as cinematographic methods. 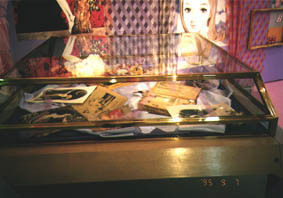 The dawn of girls' Manga was, in other words, a period when expressions marked by sophisticated story elements and bold compositions, as well as those based on cinematographic methods, were introduced into Manga that had previously consisted only of illustrations using decorative painting technique. 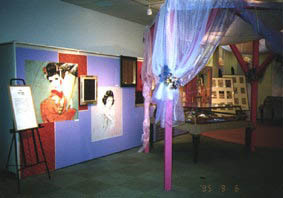 In the beginning of the second half of the 1970s, a sea change occurred in the world of girls' Manga. As exemplified by the fact that girls' Manga writers had formerly often taken themes from Greek and Roman mythology, foreign cultures, ballet, and other subjects, they had depicted the unusual beyond everyday life that readers of the time yearned for. With the emergence of a group of girls' Manga writers called "1949ers," the world of girls' Manga underwent a major change. The yearning for the unusual eventually turned into a strong awareness of everyday life instead, with attention directed to a renewed recognition of individuality, which Girls' Manga started to address. In particular, the 1949ers, who grew up reading girls' Manga by Tezuka Osamu and his followers, displayed this tendency in a marked fashion. Their attention was directed to the complexity of individuals' life and death, their solitude and destiny, and other subjects. The period during which the 1949ers grew up was also the time when Japan moved out of a period of postwar poverty and entered one of rapid economic growth. Girls' Manga writers addressed the inner lives of individuals during this period. Was what motivated them to do so a renaissance of creativity in which they attempted to overcome their ingrained mannerisms and produce new and original works, or a reflection of the distortions of society caused by rapid economic growth? In any event, the 1949ers considered story Manga essential. 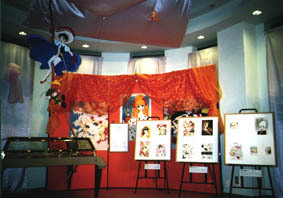 Their efforts to search for themes that were more closely associated with their own lives and look for ways of establishing their own style, and their persistent pursuit of genuine expression, combined to produce a highly literary girls' Manga and to develop girls' Manga into an established art form.